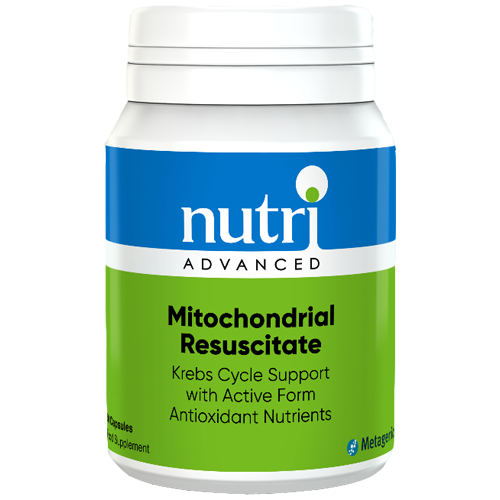 Nutri Advanced Mitochondrial Resuscitate provides vitamins C and E, glutathione, NAC, lipoic acid, CoQ10 and the polyphenols found in grape seed extract. Vitamins C and E contribute to the protection of cells from oxidative stress. Ascorbic acid is a form of vitamin C especially bioavailable to the membranes in the mitochondria. Thiamin (B1) and riboflavin (B2) support energy-yielding metabolism. Magnesium is a cofactor in glycolysis and the citric acid (Krebs) cycle. The mitochondria is sometimes referred to as the 'powerhouse of the cell as the mitochondria houses the electron transport chain which is responsible for creating ATP, the source of all energy in the body. 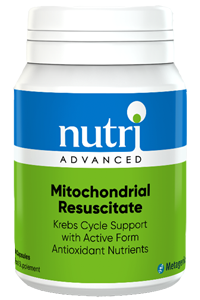 Mitochondrial Resuscitate contains important nutrient cofactors. 1 tablet twice daily, or as directed. Tableted with: magnesium stearate, silicon dioxide, microcrystalline cellulose, polyvinylpyrrolidone stearic acid.